"I am a change agent and want to continue to have an impact by helping move issues forward, particularly in education. That is what the University of Chicago School of Social Service Administration (SSA) helped me understand, and what I hope to accomplish in the future." 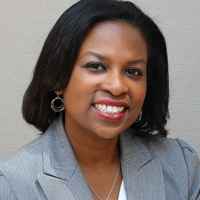 Tawa Mitchell's SSA experience has helped her succeed as an administrator in educational institutions and other public and social service agencies. Before enrolling at SSA, Tawa learned a great deal about neighborhoods, community organizations, and programs like CAPS (Chicago Alternative Policing Strategy) through her two and a half years with AmeriCorps. She was first a VISTA member where she served as a community organizer establishing and mobilizing block clubs throughout Chicago neighborhoods, focusing on public safety and issues of crime and disorder. Later, Tawa joined the staff of AmeriCorps VISTA as a recruiter of new candidates. "My year as an AmeriCorps member, and particularly working with a set of diverse community organizations, gave me insight into the management process of nonprofits. I knew that I wanted to learn more about the role of philanthropy in these organizations, and how public policy impacts them. That is when I looked to find a graduate school and found SSA. I was nervous about being accepted, but joyful when I received my letter of acceptance." Tawa enjoyed her experience at SSA from day one. "The first year was challenging, but the professors were very helpful, and I also had support from fellow students. My feelings for the administration side of nonprofits solidified; as I was drawn to helping nonprofits better manage their resources." She cites the ability to study and discuss diverse opinions, and the opportunity to take cross-disciplinary courses with students from other schools on campus, including the business and law schools, as other significant benefits of her education at SSA. Ms. Mitchell is a Program Officer in the Digital Media and Learning program at the John D. and Catherine T. MacArthur Foundation. Digital Media and Learning is a $140 million initiative designed to reimagine the future of learning to meet the needs of youth growing up in the digital age. Prior to joining the MacArthur Foundation, Tawa served as the Director of Education Policy and Partnerships in the Office of Mayor Rahm Emanuel. In this role, Tawa focused on supporting educational opportunities across the K-16 spectrum, with particular emphasis on high school and college. Tawa also served as the inaugural Interim Director for Thrive Chicago, a multi-sector collective that aims to align efforts with improved outcomes for all Chicagoans, from cradle-to-career. Previously, Tawa served as Executive Director of Strategic Partnerships at the City Colleges of Chicago where she established partnerships and programs to help support Reinvention, the District's bold reform strategy designed to increase the number of graduates earning credentials of economic value and successfully transitioning to four year colleges and successful careers. From 2007 to 2010, Tawa worked as Assistant to Mayor Richard M. Daley and served as the Mayor's liaison to the Chicago Public Schools and the City Colleges of Chicago. She was able to advise the Mayor on education policy issues due to her experiences as a Senior Manager in the Chicago Public Schools' Office of Extended Learning Opportunities. There, she managed and supported 110 neighborhood, charter, and small schools, and their 43 partner non-profit organizations. Tawa's dedication to service goes beyond education, however. Prior to SSA and AmeriCorps, she interned at the American Red Cross, Chicago Health Circle, and Advocates for Youth in Washington, DC. Since her graduation from SSA in 2001, she has remained involved with the School and SSA community professionally and personally -- and as volunteer. Currently, she serves as the Engagement Subcommittee Chair for the African American Alumni Committee of the SSA Alumni Board. "SSA and AmeriCorps alumni are a lot alike in their commitment to community," says Tawa. "I'm proud to be an alumna of both."